Busby and Wilds, Brighton & Hove, BN2 1NF. Busby and Wilds pub review, map and rating. Looking for a Hotel near Busby and Wilds? Our Winter refurb is well underway and we have a fabulous new Chef and Front of House Manager so you can put 5:30pm, Wednesday March 30th in your diary as our official re-opening time. Having had a well-deserved, and much needed, rest we have decided to re-imagine, revamp and re-open The Swan. Re-launch is planned for late March, Early April... so watch this space for news as it happens. New Years are always a time for re-evaluating lives, looking to the future and making changes. So with The Swan. We've had a lovely year and achieved some marvellous goals - turned around a fairly scary, sad building; created a warm and welcoming home-from-home for many locals and their chums; served some truly scrumptious dishes and wondrously wicked libations and built up a loyal band of fans who have supported and enjoyed us every day. For all of these we are hugely grateful. However this business is notoriously tough and with the state of the current, and looming future, economic climate we have decided to quite while we're not too far behind; to end on a high and look forward to regaining a degree of personal life. Who knows what the future will bring? All we can sensibly do, in this day and age, is plan for the present. Thank you to all of our fans, friends and customers. I was delighted to find that this previously undesirable public house has been transformed into a yummy gastro-pub for the discerning residents of deepest Kemptown. I have enjoyed several meals here over the past couple of months and it has always been a pleasure. The food is good, and the staff were friendly and attentive. Kemp Town has been a more intersting place since The Swan opened. 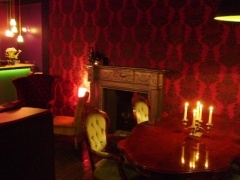 It is a bar restaurant with slightly eccentric decor, lovely staff and a great atmosphere. The food is very good and everyone is willing to bend over backwards to accommodate individual tastes. The wine list is impressive and the house wines excellent which in our opinion is the sign of a good restaurant. Thank you for opening somewhere that is warm, friendly and gives Kemp Town what it has needed for years.